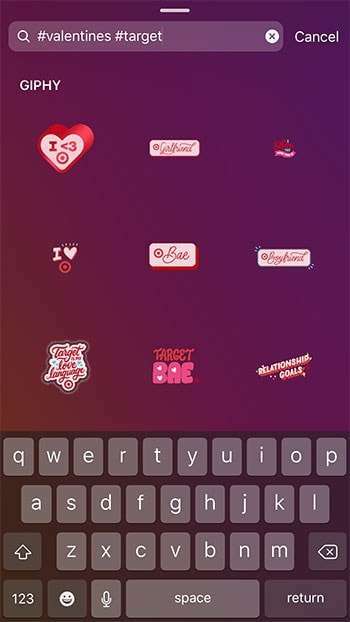 Want to add your GIF Stickers on Instagram Stories? 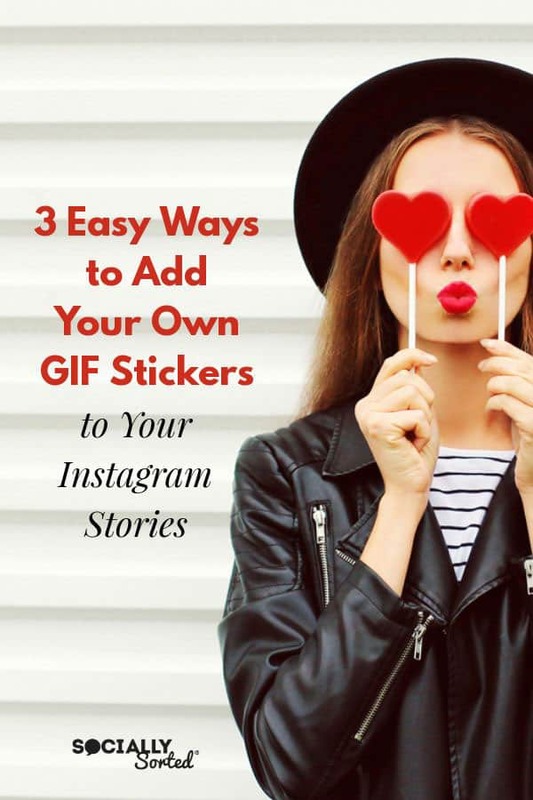 In this post I share 3 easy (but lesser-known) ways to create your own GIF Stickers and share them on your posts. You might be surprised by the potential of GIFs and GIF Stickers for your brand! Posts on this blog may contain affiliate links, which means we receive a small commission at no cost to you if you purchase through a link. If you’ve been using Instagram for a while now you would have met GIF Stickers. 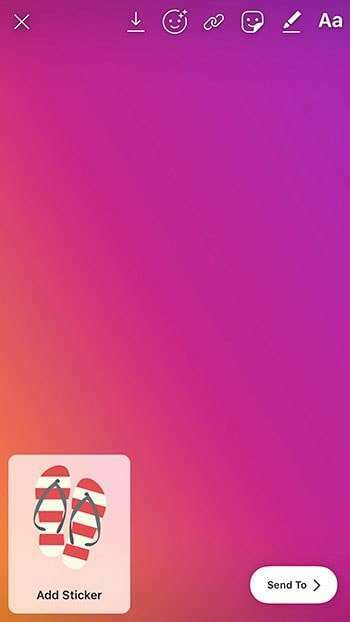 They’re the fun GIF images, videos or illustrations that you can use as overlays to place over your Instagram Stories – made possible by their transparent background. They let you add personality and interest to your posts, making them more engaging! GIF Sticker (accesses the entire Giphy Sticker library for search). Why would you add your own GIF Stickers? Most people don’t even realize that you can add your own GIF Stickers to Instagram. But you can! Now, of course, you can go the easy route and use GIF Stickers made by other brands – and by Instagram themselves – and that’s a totally valid option, especially if you don’t have much time. Here’s a post I wrote all about using Poll Stickers for instance. It walks you through how to use them for engagement. So, there’s loads that you can do with the Stickers available to you in Instagram already. But there actually is a way… 3 ways in fact.. that you can add your own custom stickers to Instagram Stories. I’ve shared them all below. When you add your own GIF Stickers you can be a little more strategic about your branding and content. And you can make your stickers your own. And add value to your community who can potentially use them too. 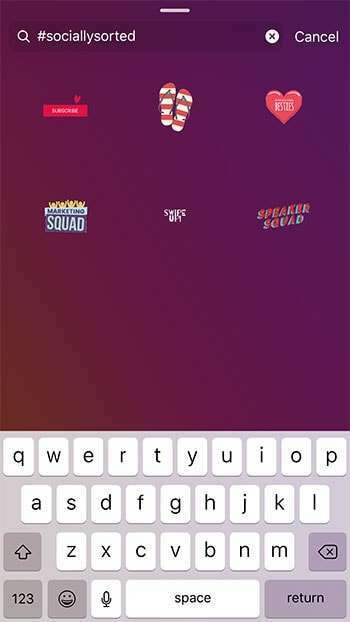 So let’s jump in and take a look at how you can create and share your own GIF Stickers on Instagram. I’m going to start with the simplest method that involves the least amount of “work” to add your own Stickers on Instagram Stories right down to the option that involves a little more work but also gives you the most options. You’re not limited to just one option. You can use all 3 in your marketing! Note: all of these methods involve adding Stickers with transparent backgrounds or PNG format images or animations. So make sure when you create your Stickers that you have them in this format. There should be some transparent “white space” around your actual image or GIF in transparent format. 1. Open up your Instagram Story in Instagram and prepare to add a Sticker. 2. 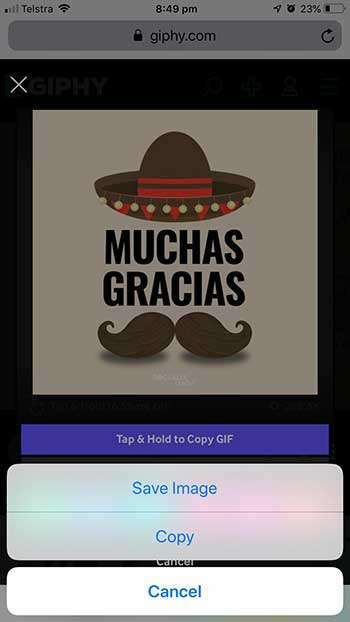 Save your completed GIF Sticker (image or GIF Sticker with transparent background) to your Camera Roll. You can do this from Dropbox, Google Docs or via Email. 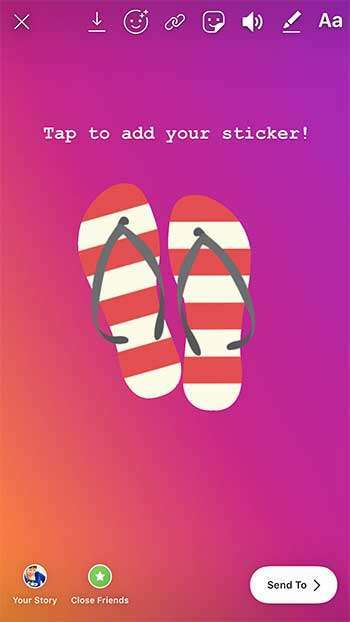 In this case I’m copying this flip-flops GIF over from email. 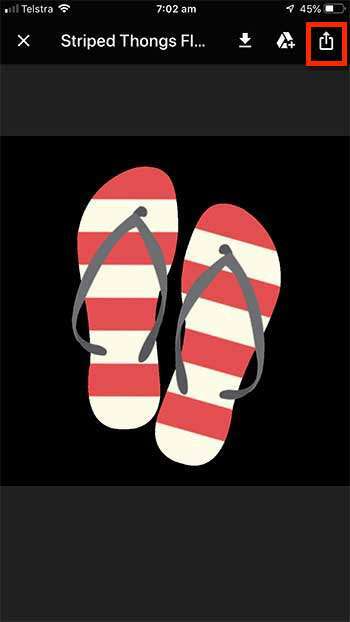 It’s a simple GIF that shows the flip-flops moving from side to side. 4. 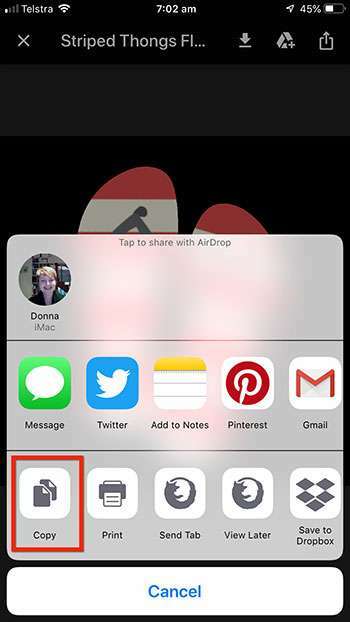 A screen will pop up with options for you to save and share the GIF Sticker. Click “Copy”. 5. Then open up Instagram again and your Instagram Story will still be there ready to go. An option to add the Sticker you just copied will pop up! Tap the “Add Sticker” Icon. 6. Voila! Your Sticker will be added to your Instagram Story, just as if you had added it from Instagram’s selection of Stickers. Cool, hey? 7. Finish off your Story as you normally would. That’s it! A few simple steps and you’ve added your own custom sticker from outside of Instagram Stories into your Story. While you get excited about the creative potential of that little trick, let’s take a look at another way you can share your own custom GIF Stickers into Instagram Stories. This takes a couple of extra steps but I’m building you up to #3 where you can really do some cool stuff with GIF Stickers for your brand. In this second option, you’re going to set up a Giphy Channel to store and share your GIFs and GIF Stickers. Honestly, I think this is a great move, and I highly recommend you do it, even if you are not ready for Step 3 (applying for a Branded Giphy Channel) yet. Host your GIFs and GIF Stickers in a central place. 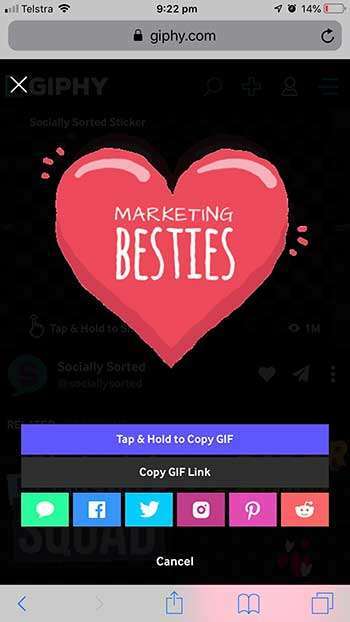 Share the links to your GIFs and GIF Stickers with your audience to use on social media. Allows you to easily share your GIFs by links as well. It’s the first step in helping others discover your GIFs for your brand – whether they be regular GIFs or GIF Stickers. Then, when you’re ready, you can apply for a Branded GIF Channel, but for now let’s get you started with a regular GIF Channel. Setting up a Giphy Channel is easy. You just simply sign up for a Giphy Account here. 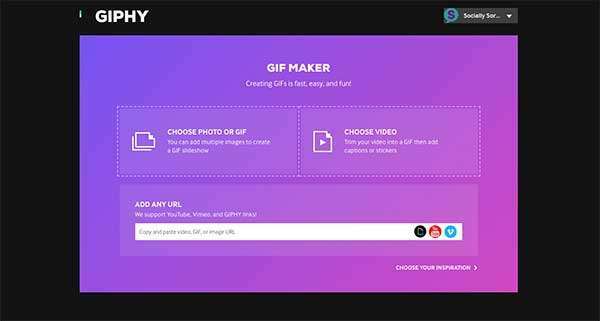 I won’t go into the how-to’s of creating and uploading GIFs in this post, but suffice to say Giphy has some cool tools to enable you to create GIFs from images or videos and to edit and upload them. If you’re looking for other articles about creating GIFs, head to the end of this post, where I’ll share some. This is super simple, and takes just a few clicks, just like #1 above. 1 Firstly, open up your Intsagram Story ready to add your Sticker. 2. Then go to your Giphy account and find the GIF you want to share. 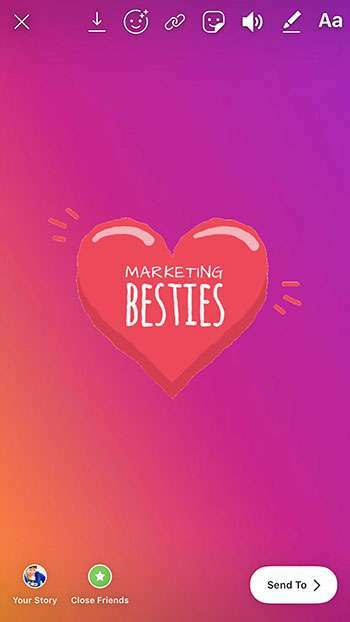 In this case I am going to find the “Marketing Besties” sticker from my Socially Sorted account. You’ll need to open up Giphy on your phone and open your account. You’ll see a selection of GIFs and GIF Stickers that you have uploaded. Note that even though I have a branded Giphy Channel, this works for regular Giphy Channels too. 5. Now you’re ready to roll, with your GIF Sticker added and pumping. In this case, the heart is literally pumping as the sticker animates. You can check it out here. I’ve kept the background simple to show you how it works, but obviously I would add this to a photo of me and my speaker friends or marketing team – however you want to use it. Scroll down to see a fun example below. 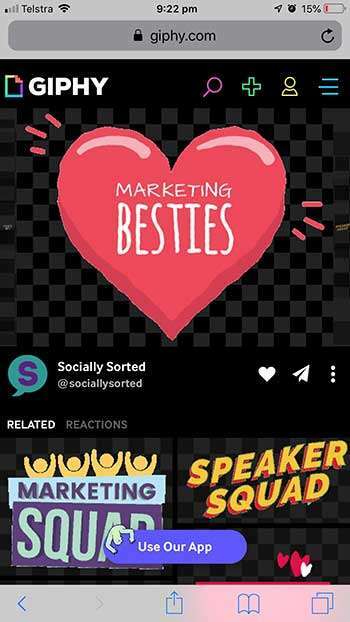 And feel free to use this one if you work in Marketing .. you can find it on Instagram by searching the hashtag #sociallysorted to see my stickers. What about regular GIFs (that aren’t Stickers?). You can also do this with GIFs that are regular GIFs (without the transparent background that makes them “Stickers”) or even regular PNG static images. 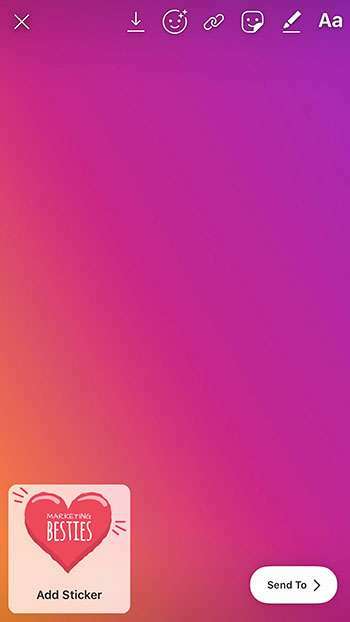 Basically this will work for any GIF, image or transparent image that you want to share into an Instagram Story. All you have to do is copy the image and then add it as a “Sticker”. Note: the above examples are all from an iOS phone. I am not sure if it works on an Android but if you know a process for making this work, please share in the comments and I’ll add it to the post. Note that Intsagram has been playing wiht a Sticker feature that allows you to instantly add a sticker from your camera roll, but so far it is only available to a small number of users. I’m not sure if it will be rolled out to everyone but fingers crossed that it will be! Now it’s time to look at the Holy Grail for adding Stickers to your Instagram Account: A branded Giphy Channel. Acknowledgement by Giphy that you are a Company, Recording Artist, Brand or Public Figure. The ability to add searchable GIFs to your Giphy account. This means that you – or anyone – can search on your GIFs via Twitter, Facebook and Instagram. Which is very cool. Tracking of “views” of your GIFs. You get to see basic stats on how your GIFs are being viewed. You can check out my Branded Giphy Channel here or click the image below. At the time of writing this post, I have 12.3 million views of my stickers. Partly because they are viewed a lot on Instagram Stories. My account got off to a great start when the Ellen show used one of my early GIF Stickers on their Instagram Story. That one Sticker alone now has over 3 million views. #TrueStory. So far I am using my channel to experiment with reach and to experiment with the potential of GIFs for myself and also so that I can advise the brands I speak for and consult with. I’ll be adding more GIFs over time, and in the meantime you can access them by searching on #sociallysorted via Facebook, Instagram and Twitter search. You’ll also see regular GIFs too that you can use in social media engagement. 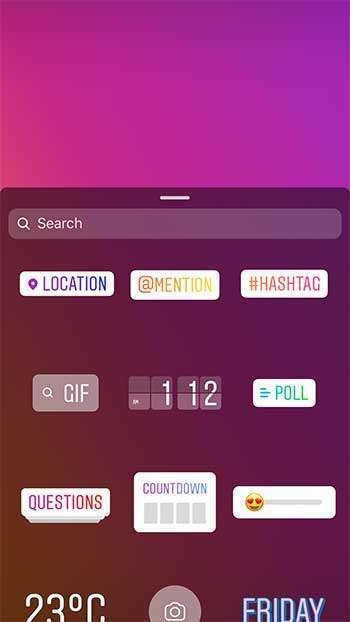 Anyone can simply open up Instagram Stories and search (via the GIF Sticker) for the GIF Sticker that they want. For example, I could search “Excited” and a whole bunch of GIFs open up for selection. 1. It means that your audience or anyone random can find your stickers via search (Hello, Team Ellen). It’s Instagram + Giphy, so the potential numbers are mind-boggling. Let’s take a look at the image above for example. 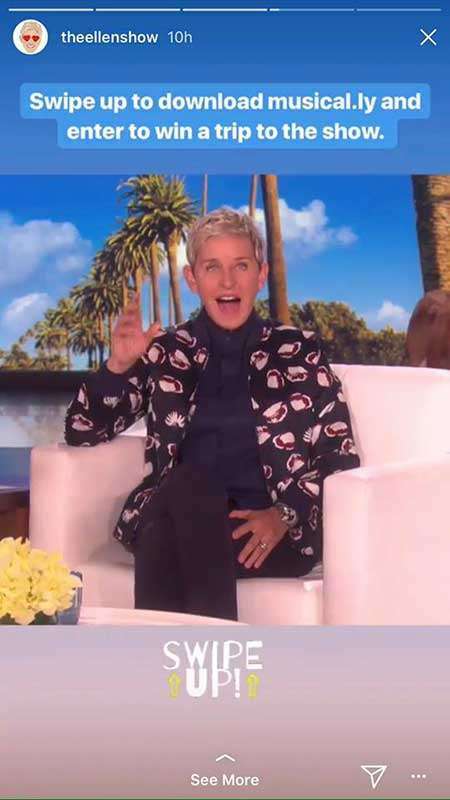 Ellen’s team usually have their own Sticker overlay for “Swipe Up” but I am presuming that they wanted to post something quickly so searched and selected by Sticker under the search for #SwipeUp. 2. You can also search for your own GIF Stickers and use them in branding. 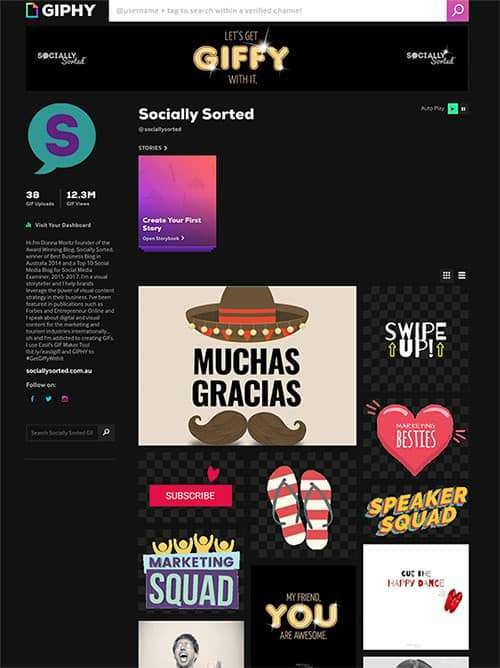 So I can open up Instagram Stories and search for my own GIF Stickers by using the hashtag #SociallySorted – as I have added that hashtag to all of my stickers for search in Giphy. I can alternatively search on keywords that I know will bring them up, like “Swipe Up” or “Queensland” for my pair of Flip Flops. Yes, they rank for high search terms, because… well… not many people are doing this as yet! Now I can add my stickers easily to my Instagram Story, in this case a post about getting excited to speak at Social Media Marketing World… and one of my favourite photos of fellow speakers and attendees from previous events! 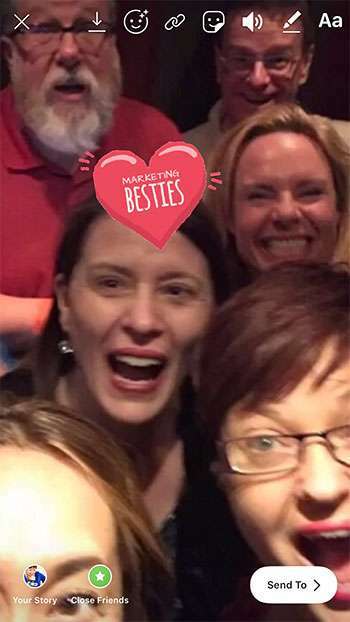 Shout out to some of my marketing besties, Azure Collier (TripleSeat), Viveka Von Rosen (Vengresso), Elena Verlee (Tech Marketing Strategist), Steve Dotto (DottoTech) and Ian Anderson Gray (iag.me). Shenanigans. 3. You can also give your audience the search hashtags or particular search terms for them to find your GIF Content in Giphy Search. 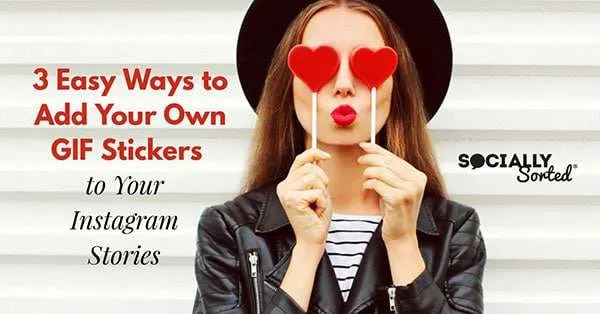 For example, if you are “Target” you might tell your Instagram audience to go crazy with their #Target #Valentines Day Stickers. Oh, and look… they show up on search! 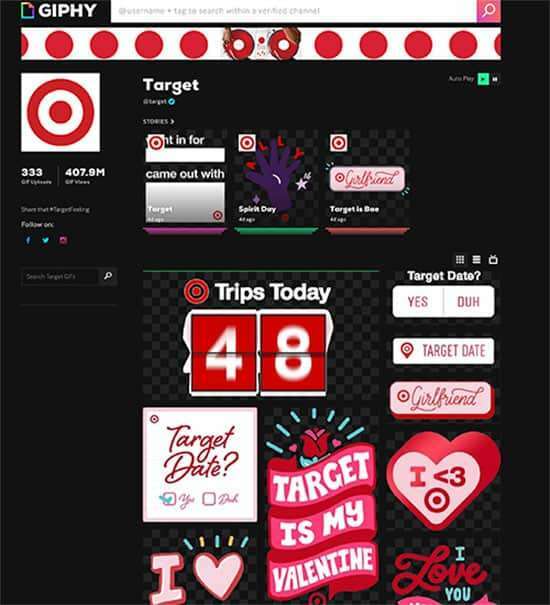 Target has perfectly optimized their GIF Selection for Valentine’s Day, knowing their fans will love to share the Target love on Instagram. The Target GIFs are branded, yes, but they are also super fun and some of them will suit any generic post (aka GIF Stickers for “relationship goals”). It may not always be super branded, but it is super target with an ROI in mind but it is entertaining to their audience. They are giving their Instagram-loving, Target-loving audience another reason to love them. Check out their Brand Channel here. Set up a regular Giphy Channel as I outlined above. Add some GIFs to your channel. I recommend you include a few GIF Stickers too (ie GIFs with transparent backgrounds). Apply to become a Giphy Branded Channel. You can apply to be a Brand Channel with this form. You can apply to be an “Artist” Channel with this form. ensure that your e-mail address is a company domain, otherwise it will be rejected. They are looking for legitimate applications, naturally. provide a functioning company website address (ie social accounts are not going to make the cut and will cause your application to be rejected). My application was accepted quickly but others have taken longer or even two attempts. 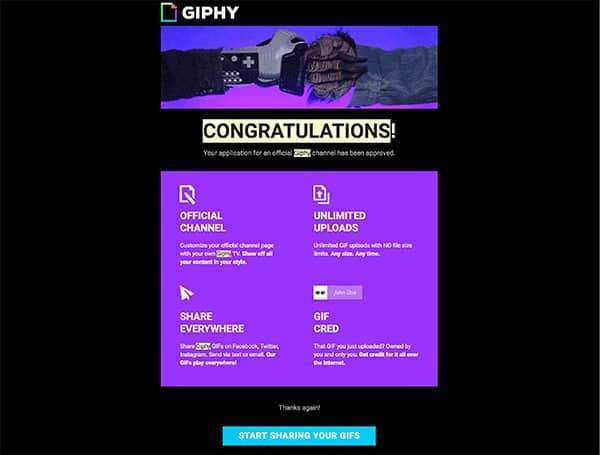 Giphy are providing more and more tips for getting accepted so I would I would follow their recommendations and add a mix of branded and non-branded GIFs that your audience would love to use and share .. and cross your fingers! I believe it’s worth applying if you already have a Giphy Channel set up. It takes just a few minutes to do the form and apply. While not always connected to direct returns or sales, GIFs and GIF Stickers can be great branding tools for replying and engaging on social media channels. They can also be fantastic for creating content for your audience to use – that taps into your brand and helps them to tell your brand story. That’s the potential I am excited about. Are you excited about the creative potential of GIFs and GIF Stickers? Are you creating or sharing GIF Stickers? Let me know in the comments below.